Stuck in M’Binda Mud with the Incommunicado Blues Again. Crossing the border from east Gabon and arriving in the northern Congo town of M’Binda in the evening, I just beat an electrical storm that worryingly continued over two hours, accompanied by a dramatic light and sound show into the night. 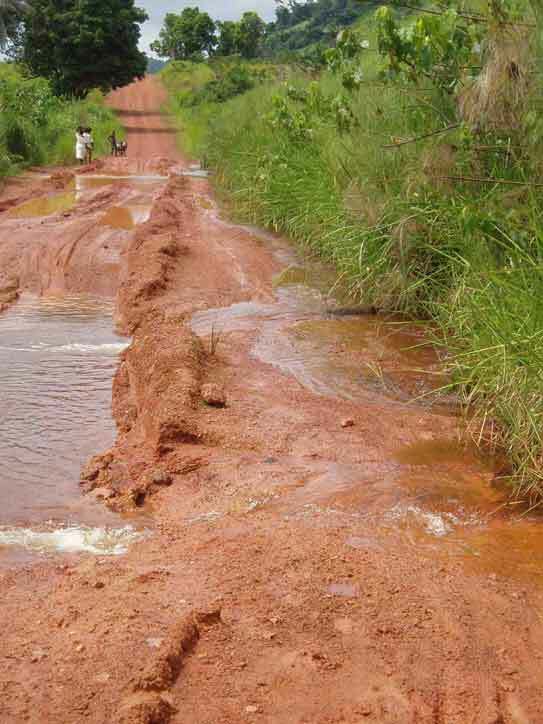 The following morning my fears were confirmed as I had to turn back not two kilometres out, mud caked wheels weaving diagonally across the road, unable to gain any purchase on the slimy surface. It was a long way to the next settlement on this little travelled track through the jungle and I didn’t fancy my chances of staying upright much further, let alone making progress. M’Binda - with a population of about two thousand and civil service of a Customs man, Immigration, police, and hospital (having seen the inside I use the term very, very loosely) - was fairly isolated. It had no electricity, no running water and no broadcast signal for radio or television. What it did have though was a railway station, at the end of a line, and there was a train due within the next few days. 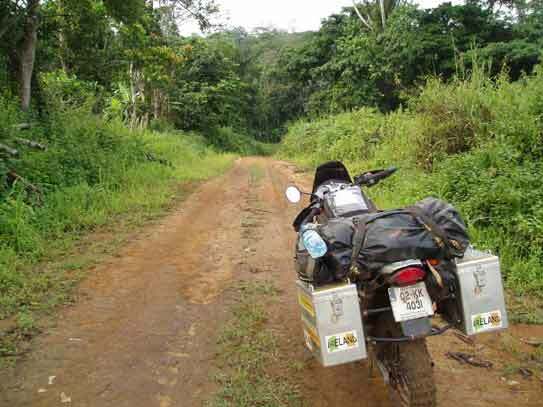 I had arrived in this remote place circuitously, having decided in Lambarene, Gabon against continuing south on the main potholed road, but to head east across Gabon into the interior, and then south into the Republic of Congo on a lesser used route. I’d been told it was possible and it promised to be more interesting. It was farewell to Tomas and Stellan, the two friendly Swedes on their KTM 950’s, in the town of Moanda, just before Franceville. I was heading south to Pointe Noire in the Congo, they had to get to Brazzaville. It had been a competitive couple of days riding with the two macho KTM’s – Tomas in particular was a bit of a speed demon - and the BMW performed admirably, not letting the side down! However my poor bike got a bit of a hammering at that pace, a few times bottoming out on the rough terrain and the front wheel smacking rocks, ruts and bumps. Along with the amount of dust thrown around, it was suffering now. My front rim had a dent and I’d noted with alarm one of my forks leaking quite a bit of oil. I felt bad - guilty and foolish, and made a heartfelt promise not to abuse it like that again! Before leaving Moanda I thought I’d better try and stem the flow of suspension oil using a trick I’d heard about. Cutting a strip from a beer can and filing the edges smooth, I lifted the fork seal cover and managed to squeeze the slip down the side of the seal. The oil oozing up I hoped would flush away any dirt particles that may have been breaking the tightness of the seal. After cleaning it as much as I could I set off hoping, a little optimistically, it would hold out to Namibia where there was a chance of getting a replacement. 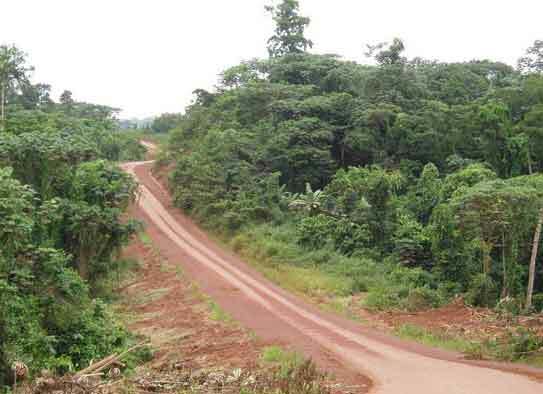 The road to Bakoumbe towards the border was very quiet – one car passed me. 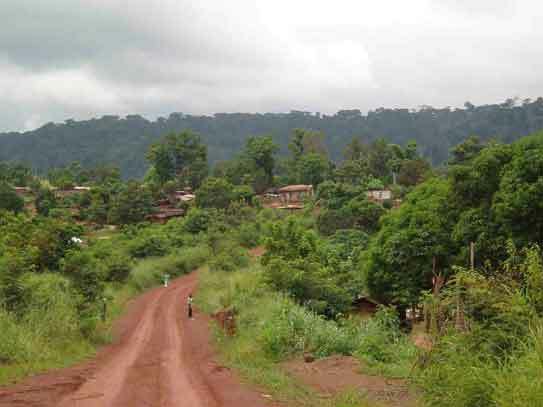 Wending my way along the poor red dirt track through the hilly jungle, at times muddy and badly rutted, passing no signs of habitation, anxious thoughts began to distract me. I was pretty sure I was on the right road, but… what if I wasn’t? (My GPS at this stage was out of action having given up the previous week due to vibrations.) What if I came off, there’s no one about to help. What am I doing on my own here! Arriving at the border town of Bakoumbe with some relief, there was a slight difficulty with the Immigration as my passport hadn’t been stamped into the country. After much comparing of exit stamp from the Cameroon, entry stamp on my carnet, filling in of statements, official stamping, and toing and froing, I was eventually allowed leave Gabon. It felt a little forlorn leaving the town, passing through the gate and disappearing into the jungle on the road for the Congo - which fairly shortly was reduced to a narrow track. This was now getting interesting. I knew I was on the right road anyway. As I put more jungle between me and the last post, the slight uneasiness returned, like an annoying insect on my shoulder I couldn’t shake off. This track was seriously empty and unused. After a while I came upon a soldier at a little shack (what had he done to deserve this posting?) and stopped. Grinning broadly he asked was I from Ireland? Travelling through Africa? I asked him how he knew. He had heard me on the radio earlier that morning! That kept me reassured and smiling. 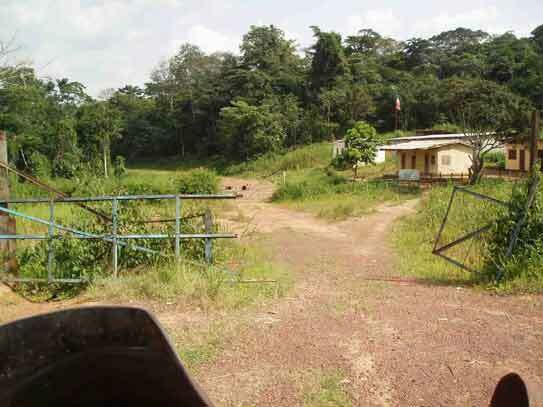 Eventually I arrived at the Gabon border in a jungle clearing - to find the Congo was locked! The grass growing on the road indicated there had been little use of this frontier. But there was a presence. I was hailed from a small dwelling a distance away, and the two border guards both in civvies made their way over. The Congolese guard informed me he didn’t have a key for the gate, and that he’d have to call for one from M’Binda, 7 kms away - using my phone as he had no credit left on his. The problem was my phone hadn’t found a network since Nigeria. A pedestrian gateway barely wide enough for the bike with handlebars angled was the only apparent option. It involved a two foot step, so I lay a few timber posts across to lessen the height, unloaded all the gear, and eased the bike up. 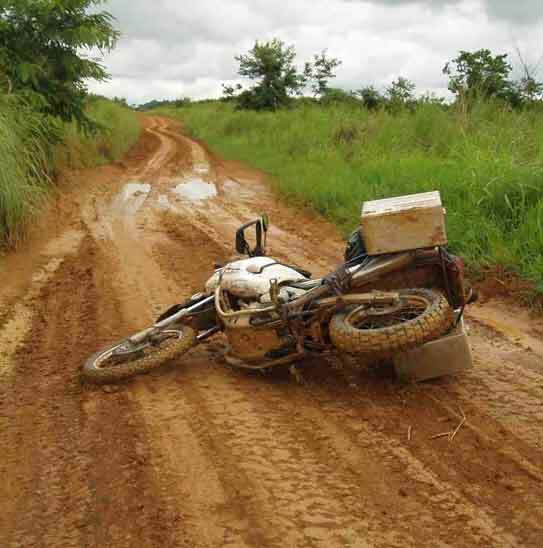 With my front wheel in the Congo and rear wheel still trying to complete the exit from Gabon, the torque from the 650 c.c engine spun a length of timber back, bruising the Gabon guard’s toe, and leaving the Congolese with a nasty gash on the shin. And I was left stranded unable to dismount from the height - with the two boys hopping around behind me in pain! We were now in a greater predicament – we had to get one of them stitched up! I stomped and thrashed a path through the bush (safe in my motocross boots from the threat of snakes!) to where the fence ended in a steep ridge. Managing to get the bike through the bush on my beaten path, there was nothing for it but to have a go in the tight space, and I spectacularly (for me!) jumped the bike over the border. What an ordeal. In the hour it took I was by now thoroughly soaked through in sweat. Buzzing with the success of getting across the border, I was dying to take out my camera for a picture of the scene, but judged it a little insensitive with the injured man grimacing with pain waiting to be brought to hospital. And so taking it very easy with the extra weight testing the suspension, I arrived in M’Binda, an injured border guard riding high on top of my luggage behind me. He proudly showed off his war wound – quite an impressive cut that elicited suitable grimaces and intakes of breath – to groups of friends as we progressed through the town. Eventually we got to the hospital, more a Clinic, a small blue building in a walled compound. A group of women squatted inside the entrance roasting peanuts. We were followed by a gang of onlookers into a bare room, paint peeling from the walls and debris lying around on the floor and windowsill. A gentle looking man in his fifties, the nurse, turned up. Before doing anything he did up a detailed bill which came to about €20 and presented it to me. I made my point that it was an injury in the course of work, emphasising the guard definitely shouldn’t be liable, it’s the responsibility of his employer - but paid up. Making my way back over the track to the ‘main road’, I was then directed to the customs, police and Immigration. All in one small concrete room, the different officers arrived with their respective stamps. I got the distinct idea my unexpected arrival was the first duty they had been called to perform for quite a while. The Customs officer confirmed in the year he was there I was the first motorbike traveller he’d seen, their usual duties involving the weekly market here. At this stage as it was too late to consider continuing, I made enquiries as to sleeping possibilities. The police officer, who he told me had been phoned by his injured buddy in the clinic, now seemed to befriend me and take personal responsibility for my welfare. He brought me up to the Catholic church, where the deacon received me with great hospitality, showing me to a room apologising for the lack of running water or electricity. That evening there was enough electricity in the storm to power the whole country! The next morning after my aborted attempt at leaving in the mud, I made it back to the church to be told with a smile - you have a home here as long as you need. Fr Boniface and the deacon, Placide, were generous hosts. (A deacon I discovered is a trainee priest, Placide having studied six years in Brazzaville and Kinshasa.) At the train station, outside of town and quite an ordeal getting to through some muddy patches, there were varying stories about the train’s arrival and departure time, but I got the idea it would be arriving at some stage of the day and departing four hours later for Dolisie, on the main Brazzaville to Pointe Noire road. Arriving back to the church I was ushered in to join the communal brunch – it was 10 am – the main meal of the day, consisting of bread, various starchy tubers, some tinned sandwich ham and plantains, or large bananas. That would keep me going for the day. Fr Boniface was amused at my plans to take the train. The last time he had to take it, he said, it took two days to complete the 300 km journey, stopping at every settlement on the way for hours. Everybody crammed in “comme sardines”, no protection from the rains. “Horrible.” Well, I had no choice – I was marooned as I thought. We passed the morning chatting, joined by Jules a young man in his twenties. He was visiting from Brazzaville and was also waiting for the train. Jules was an ambitious, well educated guy and it was interesting to note the difference in approach betweeen himself and the middle aged Fr Boniface to the subject of Congo’s woes – a subject that naturally arose on my querying the situation here. I was to find “the war” referred to a few times during my time in the country, referring to the periods of hostility in 1992, ’97 and then most recently in ’98. Most of the mainly French and Belgian Europeans had to flee the country because of “le pillage” - there were none either here or Mossenjo, Congo’s fourth largest town, 100 kms from here. 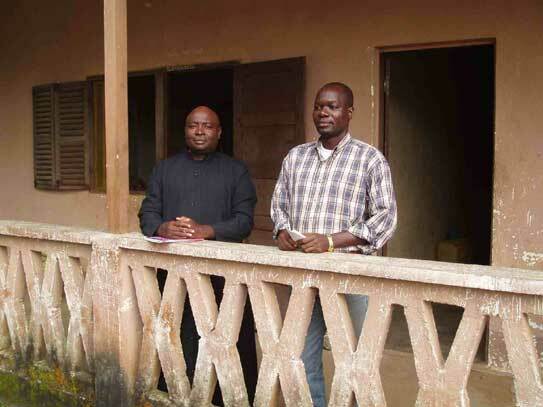 As Fr Boniface saw it, without the ex-pats running the infrastrucure, now the Congolese had to organise themselves. Jules became quite passionate in his denunciation of the management of the state, lambasting the government for allowing isolated towns such as M’Binda to languish without access to information – no radio, electricity, computers or internet. There are electricity pylons in place from when Gabon used to transport their manganese ore by rail through here. However since they completed their own railway to Franceville, M’Binda had been allowed to sink into neglect. There wasn’t the leadership needed. He claimed Congo was the continent’s fourth largest oil producer – after Nigeria, Angola amd Equitorial Guineau (I’m not sure where that left Libya) – and had a GNP equivalent to neighboring Gabon, the wealthiest country in Africa! But what was being done with the earnings, he demanded. It wasn’t being effectively invested in the infrastructure. Fr Boniface nodded in agreement with most of Jules’ points. I could see that he was impressed, as I was, with his youthful though articulate passion. He worked with an NGO introducing IT to the country, with contacts in Europe in search of redundant PC’s replaced with newer models. With my limited French I understood Fr Boniface’s main point as it being actually down to individuals. It was people who carried out the war, made various decisions about funding, did or didn’t strive for change. Why wasn’t there any organised town representation here? He himself had the intention to start an information centre at the church for the towns folk to use the internet. He wasn’t however, confident it would be exploited fully. An interesting discussion illustrating for me the difference between youthful eagerness and the wisdom of age – both necessary! The clutch cable had broken that morning as I was returning from a little recce of the mud. I had a spare already tied to the original, so it was a straightforward job to replace. While doing that and a few other maintenance bits and pieces, with the inevitable audience, one of the locals hailed a passing man with a makeshift pack on his back. The man was a hunter, returning from two weeks in the jungle with his bounty. The pack was opened up. 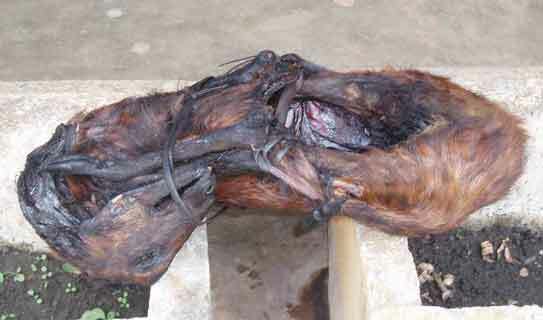 Inside were six antelope and three badger type animals, all trussed up and smoked to preserve them. 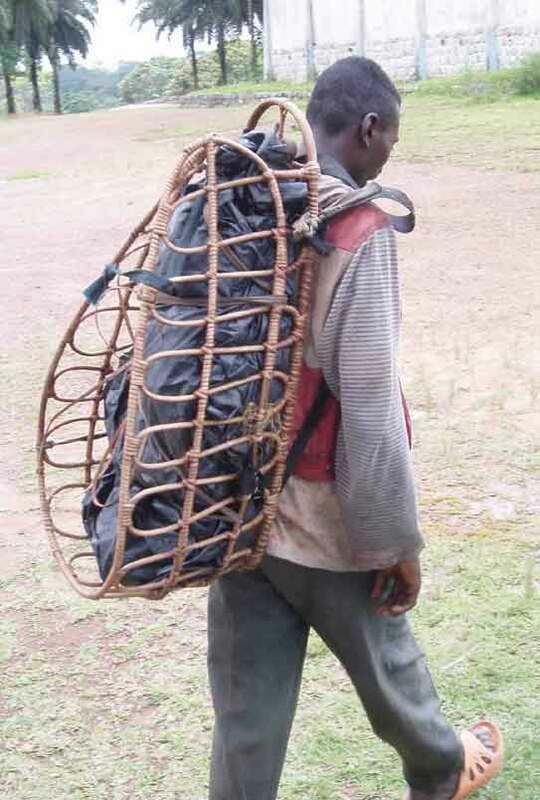 He had walked four days out of the bush with the load in a homemade frame on his back. The local who hailed him bought the six antelope for an upcoming celebration, the price agreed the equivalent of fifty USD. He walked off with his load much lighter! I ended up heeding local advice that the heat of the sun would improve conditions in the afternoon, gave the train a miss, and was delighted I did. The following few days brought a challenging and hugely satisfying journey in the mud and jungle through a little travelled part of the Congo. The first part of the journey was a little slippy - I unavoidably came off once in a wide mud patch, disguised with a seemingly firm surface. I had learned a technique in picking up the bike at the BMW Off Road course all those months ago in Wales. The trick is to find the point of the bike furtherest away from the tyres – the end of handlebar. So first thing is to twist the handlebars if necessary, then just lift it up! It was one thing on a bare bike, and I was delighted to find it could be done on a fully loaded bike as well. The pannier boxes were the thing, providing a fulcrum effect and raising the bike slightly giving a start, all that is needed is the extra heft up. Heavy but doable. I gingerly continued on. After that little success I was delighted, now knowing coming off with nobody around to help lift the bike wasn’t a big deal. That took a weight off my mind! It had been the case on the trip for me, that the more ‘interesting’ or challenging parts of the riding weren’t photographed - my focus was more on dealing with it rather than stopping and taking a picture. It was only past the difficult bits or at the end of the day I’d reflect back and regret not having a photo of that particular stretch, or challenging hazard. With this in mind, when I came off in the mud between Macabana and Mila Mila, out came the camera to record the event! 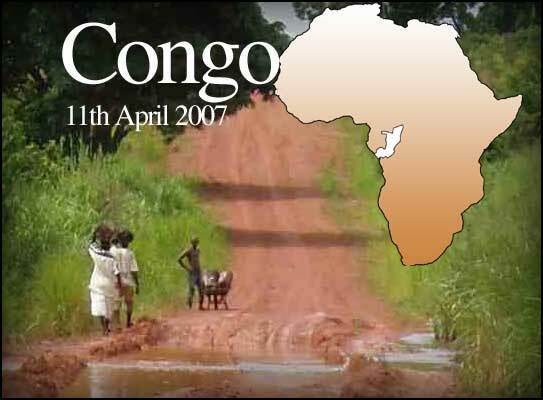 Congo – this part particularly - was noticeably poorer than its neighbor Gabon. Any settlements I passed were of very basic wooden shacks. The first town was Mayoko, where I was stopped by the local police man and ushered into the station, a very bare two roomed affair. After managing to get the officer onside with my ‘politeness offensive’, another huge man in a floral shirt entered and I realised I had been wasting my efforts. Idi Amin was ‘the man’. He undid a series of locks on another door and ushered me into his office. I got the distinct impression from his manner he thought Christmas had come. Inviting me to sit down then spending some time over my passport, he wanted to know what I was doing in his town, and I spun out the story about the trip for charity pulling out the laminated copy of a letter from Monica in Self Help. Even though it was in English, it seemed to make some impression. In my efforts to keep the tone conversational I discovered I was the first tourist he’d seen, since ‘avant’ anyway. ‘Before’ what I asked. Before the war in ’92! He was in no hurry to let me go, but I had a distance yet to go on bad roads and wasn’t keen to spend any longer than was necessary to avoid any difficult situation here. Eventually I judged it ok to ask for the passport’s return, and briskly headed for the bike. On an impulse I asked for a photograph, which he agreed to, proudly posing. I showed it to him on my digital screen. That always got a good response, and felt less like taking something from the subject. 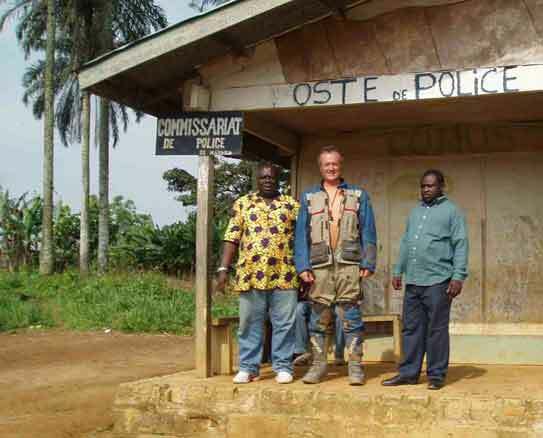 There is a requirement on entering any village, to check in with the police before continuing. A few times there were attempts to get my attention, but I ‘innocently’ waved and continued. Once I made the mistake of stopping for a brief snack, and was nabbed for an interview at the ‘station’ – this time a one roomed wooden shack. The officer was relatively young and took his responsibilities seriously. His job was to record any movements through his jurisdiction, he said. “What happens if you disappear on the road? We have to have a record of where you have passed.” The more time I spent in the country the more I got the impression there was a sense of authority with responsibility about – along with naturally the old guard used to exercising their authority for their own benefit! This visit only cost me a few of my precious Gitanes I’d stocked up on in Yaoundé. Further on there were some trucks pulled up, for a while by the look of the tent under one and a cooking fire near another. 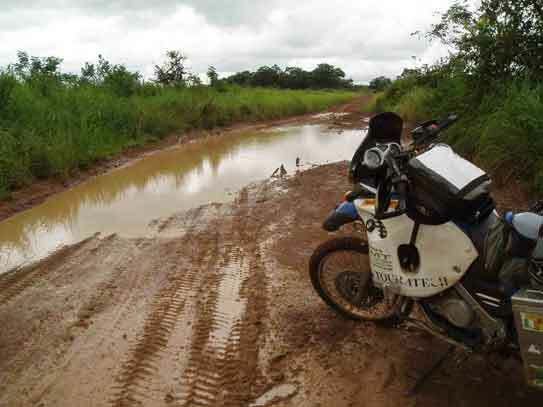 A river flowing across the road had scoured a channel about four foot deep, but fortunately I was able to get the bike through a pool on the side – disturbing a soaped up driver who was bathing in it. Some distance further on the road had been washed away, an area of flowing water in its place, but once again the benefit of two wheels was that I could find a path through that was only about two foot in depth. Later, at a bridge of loose planks over a small gorge, I had to dismount and walk it before crossing – not hesitating once on it! All the time I was anxiously preparing myself for something more impassable as I progressed. It was now getting dark and I was pushing it to try and get to Mossendjo. The forest began to be replaced by cleared patches, and I was constantly looking for any signs of the town. A boy with a book in his hand at the side of the road must definitely indicate a town, or was that a false hope? Ten minutes later I thought I caught a glimpse of a light in the distance. Further on it was still there, and then was that another? Eventually the road surface improved and I entered Mossendjo at 7.30pm, with that joy and relief that comes after a lengthy ordeal. My progress had slowed right down in the darkness and I’d made it just as I’d slowed to a crawl. Once again I was made welcome at the ‘mission Catholique’, given a room – this time with electricity and a mosquito net! – and invited to join the deacon for dinner. 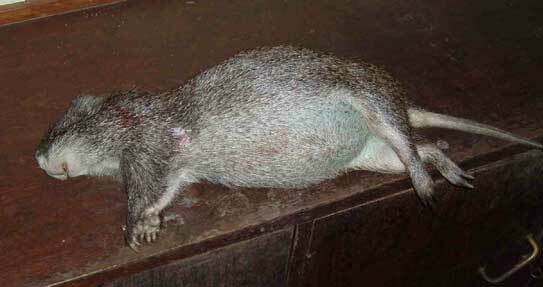 On the menu was bush meat - ‘herisson’, hedgehog according to my dictionary, which a parishioner had donated. It was tastier than it smelled, which was a little strong. I had my first Primus beer, the infamous brew from DRC that had no alcohol percentage on the label - variable strengths meant you didn’t know how drunk you were getting. It tasted good (even better if I could get a cold one which I found very elusive in the Congo). As with many of the priests and deacons I met, Abbé Franck was well educated, having spent eight years in Rome. In response to my query about the strength of the Catholic church here, he said he was disturbed by the growth in neighboring DR Congo of Christian cults which were using the radio and television to wheedle donations from poor people in return for ridiculous promises of salvation. You can’t get on a bus, he said, without a preacher coming on looking for money. And we are losing people to them, he claimed. I just don’t understand how people can believe them. The next morning I heard the incongruous strains of lauds, Latin chants more associated with Rome than a small church in the Congo. Abbé Franck had a beautiful voice. The morning mass was not hugely attended, though the singing, as I’d heard the previous morning in M’Binda, was a joy to hear, harmonies soaring through the upbeat African hymns. Breakfast in the roadside cafe opposite was bread, a tin of sardines and Nescafe – the standard as evidenced by a few others eating. The road from Mossendjo to Macabana was an improvement, though a fair bit of sand each side of Titi slowed things down a bit. I had learned at this stage that water wasn’t too bad as it meant the mud at the bottom was usually diluted. 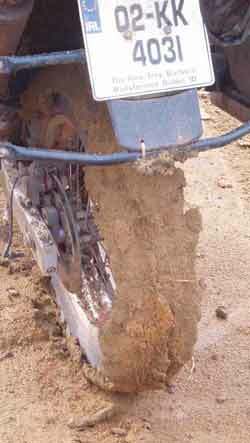 The surface mud however could be very messy, and when it stretched on for a distance was very hard work. I came off a few times. Making it a more difficult was the engine wanting to stall at low revs, maybe a wet plug. This was no good trying to maintain tyre grip on the slippy, wet surface – too much throttle and it would skew sideways, not enough and it would cut out when I needed it! It was disheartening as it went on and on, until with delight I reached the main road at Mila Mila. I was in a great mood at the police checkpoint, and met a request for “something for me” at the police stop there with, “Actually I do have something for you” as I fetched a www.kilkennytocapetown.com sticker, saying, “You have children, do you”. That wasn’t really what he had in mind but he couldn’t really persevere, though he followed me out to my bike and tried. The pace picked up as I easily covered the remaining distance to Dolisie in a few hours. I was hungry after the day’s hard work and had a good feed of capitaine stew in broth with manioc, a rubbery root vegetable that took some getting used to, but at this stage we were well enough acquainted. A severe downpour that persisted put me off continuing to Kimongo and the border, along a notoriously bad road, and I splashed out €12 on a room in Sala N’Golo, a hotel, restaurant and church on the edge of town. It was clean, spacious, soap and towel provided – and had a fan. It was great to relax, do some washing and just enjoy the fact I’d made it through the mud and jungles of Gabon and Congo. I’d made it! 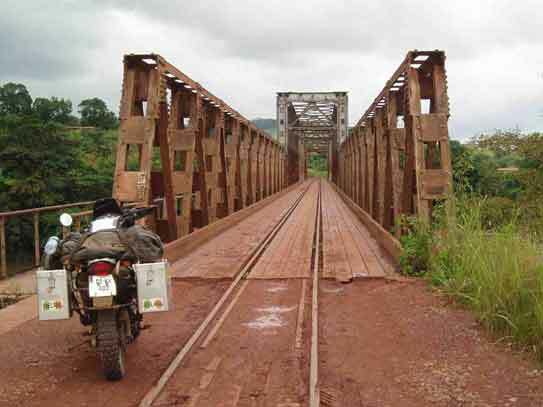 Unknown to me then, I had a bit more fun and games to come before getting to Cabinda and Angola!